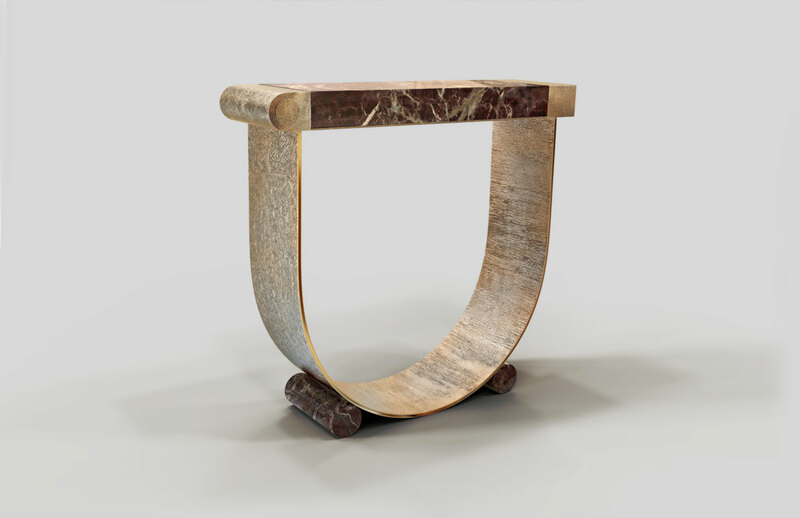 Renowned for drawing upon the different histories of Rome within his work, architect and designer Achille Salvagni has found inspiration a little further afield for his latest furniture exhibition. ‘When you arrive in Pompeii, you are struck by the colours of the walls, mosaics and frescoes,’ says Rome-born Salvagni, recalling his visits to the archaeological site. ‘Even in their muted tones, they are beautiful and always remind me of spring.’ So taken was Salvagni by Pompeii’s faded palette of pale greens, earthy reds, burned oranges, blushes and blues, that he used it as the basis for a new themed exhibition which is set to be unveiled at Salvagni’s Mayfair space this week. Put together over a six month period, the assembly of furniture includes three new pieces alongside other updated designs from Salvagni’s existing collection of over 100 works. Each one is handmade by craftsmen in Rome who, before working on the Atelier’s fine furniture, were more accustomed to carrying out restoration work around the city. ‘I think the reason they [the craftsmen] enjoy this collaboration is the excitement about producing a contemporary work, but [also] using age-old artisanal methods,’ he muses. New pieces include the ‘Gio Louro Faia’, a double door bar cabinet in lacewood with a polished and protected smooth brass top, inset gold handles and bronze legs. With its generous elongated seat upholstered in smooth velvet, the ‘Tato’ chaise joins Salvagni’s family of ‘ato’ armchairs, while other existing pieces, such as ’Bench’, shown in an inviting grey astrakhan wool, have received Pompeii-inspired updates with new finishes, colours and fabrics.